BRUSH twice a day with a fluoride toothpaste to remove PLAQUE – the sticky film on your teeth that’s the main cause of tooth decay. Visit your dentist at least twice yearly for professional cleanings and checkups. Even if you brush and floss regularly, you may face certain oral health issues as an adult. Luckily, Dr. Pile can help you meet most of these challenges quite successfully. GINGIVITIS: which is the early stage of periodontal disease and at this point, is still reversible. Symptoms of gingivitis include red, swollen or tender gums that tend to bleed when you brush them. If you notice any of these symptoms, see your dentist before serious problems develop. Advanced stages of gum disease may lead to tooth loss. PERIODONTAL DISEASE: The HEALTH of your gums can also affect your overall health. Recent studies have shown a possible link between PERIODONTAL DISEASE (gum disease) and other diseases, such as DIABETES, HEART DISEASE and a possible link to PREMATURE BIRTHS. To prevent gum disease from getting started in the first place, be sure to brush twice a day, floss daily and schedule professional cleanings every six months. CAVITIES: around existing fillings (called recurrent decay) and decay on the root surfaces of the teeth become more common as we age. So it’s important to brush with fluoride toothpaste, floss daily and see your dentist regularly. SENSITIVITY: can be an increasing problem as one ages. Your gums naturally recede over time, exposing areas of the tooth that are not protected by enamel. These areas are particularly prone to pain due to cold or hot foods or beverages. In severe cases cold air, as well as sensitivity to sour and sweet drinks and foods, can occur. If you experience sensitivity, try anti-sensitivity toothpaste. If the problem persists, see Dr. Pile, as the sensitivity may be an indication of a more serious condition, such as a cavity or a cracked/fractured tooth. CROWNS: are used to strengthen damaged teeth. A crown entirely covers or “caps” a damaged tooth. Besides strengthening a damaged tooth, a crown can be used to improve its appearance, shape or alignment. IMPLANTS and BRIDGES are used to replace missing ones. Dental implants replace one or more teeth or are used to attach full or partial dentures. Consult with Dr. Pile to see if implants are right for you. Bridges are commonly used to replace one or more missing teeth. They span the space where the teeth are missing. Bridges are cemented to the natural teeth or implants surrounding the empty space. Each time you consume foods and drinks that contain sugars or starches, such as POP and SPORTS DRINKS the bacteria in plaque produce acids that attack your teeth for 20 minutes or more. To reduce damage to your tooth enamel, limit the number or between meal snacks and drinks. And when you do snack, choose nutritious foods such as cheese, raw vegetables, plain yogurt or fruit. Teenagers can be tough on their teeth. They may be so busy with school, jobs, athletics and social activities that it’s difficult to find time to brush. They also tend to eat a lot of junk food. Combine the two and you’ve got a situation ripe for DENTAL DECAY. Not surprisingly, this is the time when many children develop a lot of cavities. If you are a parent, talk (and talk and talk) to your teenager and encourage him or her to take good care of his or her teeth. This means brushing and flossing at least twice a day. Teenagers care a lot about how they look. Help your child understand that bad oral hygiene contributes to teeth stains, bad breath, missing teeth and an assortment of other dental problems. Set a good example. If your teenager sees that you take good care of your teeth, it will reinforce that good oral hygiene is important to you. Your talks and warnings will not seem hypocritical and will carry greater weight. 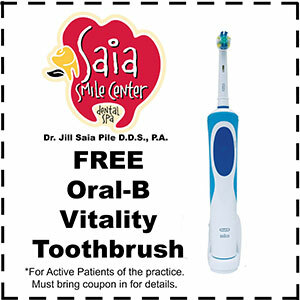 Have plenty of oral health-care supplies on hand for your teen to use. Keep soft toothbrushes, colored or flavored floss (or plastic flossers) and good-tasting toothpaste out in the bathroom and even in the kitchen for them to use when they are in a hurry. Don’t buy JUNK food. Instead, keep lots of fruits and vegetables in the house for snacking. Each time you consume foods and drinks that contain sugars or starches, such as POP and SPORTS DRINKS the bacteria in plaque produce acids that attack your teeth for 20 minutes or more. To reduce damage to your tooth enamel, limit the number or between meal snacks and drinks: when you do snack, choose nutritious foods such as cheese, raw vegetables, plain yogurt or fruit. Most dentists recommend that children start their dental visits by the age of two. However, if you notice that your child has a problem with her teeth or gums prior to this age; please schedule an appointment with Dr. Pile. While at our office, we make sure that you receive the highest level of service and ensure that our dental work is of the highest quality. To ensure that you maintain great oral health, this level of quality needs to extend into your personal oral hygiene routine. We can help you establish a dental hygiene routine that will keep your teeth healthy and white. If you have any questions about your current hygiene plan please ask us.